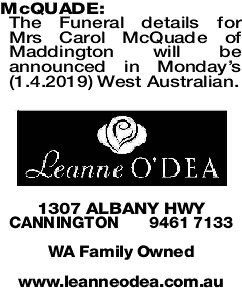 The Funeral details for Mrs Carol McQuade of Maddington will be announced in Monday's (1.4.2019) West Australian. 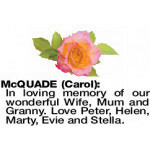 In loving memory of our wonderful Wife, Mum and Granny. 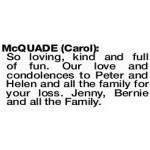 Love Peter, Helen, Marty, Evie and Stella. So loving, kind and full of fun. 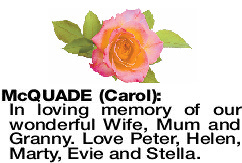 Our love and condolences to Peter and Helen and all the family for your loss. Jenny, Bernie and all the Family.